In an environment dedicated to innovation and free thought, our highly talented design team, work with the latest 3D Computer Aided Design tools to capture design intent with your engineers. This technology proves an invaluable tool in communicating and developing conceptual solutions involved in coengineering partnerships as we can share 3D data in many standard formats including IGES and STEP. Change control and configuration management techniques are used to ensure that the design intent is fully embodied into the finished product; with our combined visual and CMM dimensional measurement system being programmed from the original 3D CAD model. Using FEA as a mathematical technique to predict deflection (strain), stress, reaction force and contact pressure based on dimensional information, physical constraints and material properties improves design integrity and speed. Our Materials Technology Centre can generate temperature specific, validated, hyper-elastic material models on which to base these analyses. 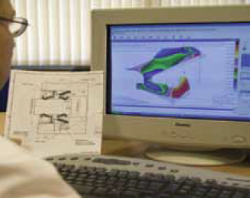 FEA allows our engineers to rapidly iterate to optimal design solutions, minimising product development time and cost.